Ever wonder where your partner will pop the big question? Do you secretly hint at of the kind of proposal you’re hoping to experience? Do you wish for many people to witness this magical moment, or to experience this life-changing moment in private? Women are allowed to dream, right?! We owe astrology a huge thanks for providing the following insight towards our own Zodiac sign. With your partner being imaginative and curious as you, you’ll have to think of a proposal out of the box! A proposal in Barcelona, Spain or guest stage appearance at a concert will be the ideal proposal your partner will be dreaming of. Your partner will have to be original with their ideas, as they do expect thought and imagination to go into planning such an extraordinary event. Your appreciation for nature will never cease to amaze you. If your partner is able to get down on one knee and present that ring to you in the most basic setting amongst nature, you will feel like the luckiest woman in the world. Proposing during a hiking adventure, or date night on the beach, is the optimal proposal for a Pisces woman. Aries, you fall victim to receiving an overabundance of affection and love from your significant other. You bask in the constant, romantic affection and expect your proposal to be just as dreamy. Hoping to be swept off your feet, a proposal in Paris near The Eiffel Tower or on an exotic beach in Greece is the ultimate proposal to win over your heart. You desire the simple and easy things in life. You aren’t expecting nor want a proposal with lots of attention or at an overseas destination. Avoid huge travel plans and expect a proposal in a beautiful park or during a walk by the water. No doubt your partner will decide to give you the rest of their lives! You don’t appreciate routine, especially regarding an event as significant as your proposal. You are expecting a proposal out of the ordinary from your partner. Perhaps a proposal after scuba diving or while viewing the Northern Lights will exceed your expectations. Gemini, you are craving the fairytale proposal! Cancer, you focus on the deeper significance of a proposal. It’s not about the ring or where your partner plans on proposing; as long as you truly feel your partner is the love of your life, you are set to become engaged. You are craving that once in a lifetime proposal, Leo! A proposal near a waterfall or amidst the vines in a vineyard is romantic and memorable — just what your heart desires. You are detail-oriented and appreciate the many efforts that contribute to one solid plan. Your partner must plan an itinerary around your proposal in order for you to least expect it from occurring. 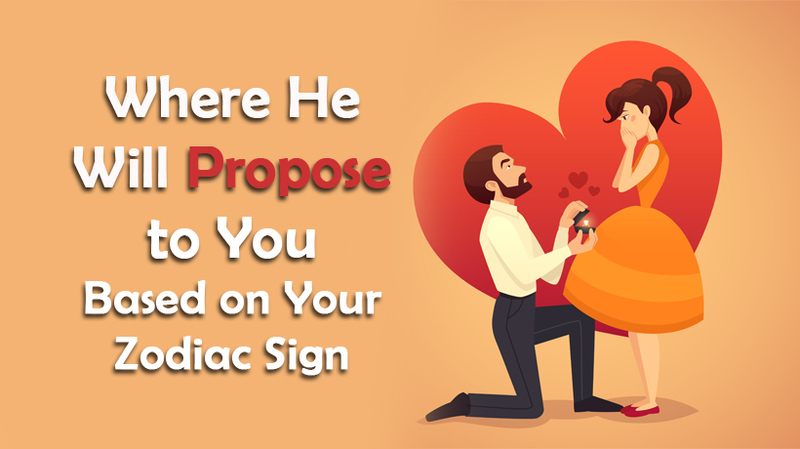 Being the most romantic of the astrological signs, you are hoping for a whimsical proposal. Your partner attempting to make you feel like a princess in Disneyland by the iconic castle falls along your lines of a “fairytale” proposal. You are very passionate about your relationship. In fact, the stereotypical symbols of romance, such as roses and champagne, will suffice to celebrate your engagement. Always craving a new adventure, you want a proposal that is thrilling. The best time for your partner to propose can be while backpacking across Europe, or during a wild safari in Africa. Devoted and ambitious individuals, they are well-deserving of a proposal that can be perceived as traditional, but far from boring. Proposing at a romantic spot in nature, the location should be classy and beautiful. For example, proposing at Rockefeller Center wouldn’t be an ideal choice, but a beautiful, romantic dinner in Europe by the water, might be a greater alternative.